Folk rock pioneers Steeleye Span are playing in Buxton this month. Touring a new live show with Maddy Prior at the helm, the line-up features faces old and new. The band entered a new chapter two years ago. 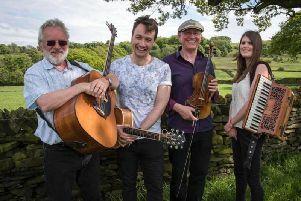 With the departure of fiddle player and long-standing member Peter Knight, who visited Buxton earlier this year with Gigspanner, the band introduced Jessie May Smart. Their latest CD, The Essential Steeleye Span - Catch Up, was released at the end of last year and looks back on the band’s long and lasting career. Steeleye Span visit Buxton Opera House on October 14. They will perform some of their new gems alongside the classics that have made them one of the most successful British folk rock bands ever. Other music events coming to the town include Lynched, a traditional four-piece folk group from Dublin (October 17, Pavilion Arts Centre). Combining uilleann pipes, concertina, Russian accordion, fiddle and guitar, the music ranges from music hall numbers to street songs and Traveller tunes.